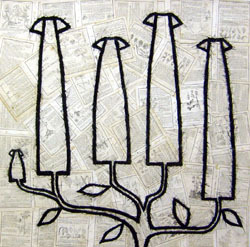 Carrie Haddad Gallery presents a group exhibition of paper from artists of the region. A fundamental attribute of working on paper is its ability to transmit light through color. With the advantages ranging from its absorbency, slight texture, brightness of surface, and archival qualities, paper is a preference of many artists wishing to indulge in spontaneity, be it drawing from memory or creating many variations on a theme to perfect a technique. Paper requires no preparation, unlike other surfaces such as canvas or panel, and is relatively inexpensive, so artists are free to experiment and explore. Furthermore, some artists employ paper to materialize, rather than suggest, physicality, weight and dimension via sculpting or collage. “Paper”, on view through October 4th, offers examples of various techniques and impulses from these artists that transcend the sketch pad and become a single work of art. The public is invited to meet the artists and see the new work on Sunday, August 30th from 2-4pm. Refreshments will be served. Inspired by the beauty of daydreams, Ellen Nieves revisits family photographs with a pencil and paper through a lens of nostalgic innocence. The result is a series of vintage images that playfully mix with elements of the surreal. Nieves will also exhibit selections of her Botanical series that explore communication between two species, combining forms of Land and Sea in a single environment. Also favoring pencil to paper, artist David Dew Bruner dramatically reinterprets the famous “Olympia” as originally painted by Manet in studies of shifting cubists planes. The deep interwoven marks of graphite in each piece is then enhanced and complimented with a vintage frame, merging modernity with antique. The artist is once again at work in his studio – the old train depot in Valatie, NY, developing two new series inspired by Infanta Margarita and the artist, Richard Linder. Melinda McDaniel & James Meyer are masters at manipulating paper, cutting and bending the medium into intriguing displays. McDaniel uses unprocessed photographic paper stock that is deconstructed and reconfigured to produce minimal wall sculptures delicately made with wood, thread, pins and vellum; time and light work together to fill the paper with latent images. The subtle imagery hidden within the warped layers of photographic paper is abstracted, both seen and unseen. McDaniel received her MFA in photography from The Ohio State University and exhibits extensively nationwide. James Meyer will exhibit graphic cut-outs framed in shadow boxes which feature reoccurring images in a repetition of vivid color. The shadow produced by each cut extends the paper from its two-dimensionality, furthering it into the viewing space. Meyer's work is featured in private and public collections including the Whitney Museum of American Art. Louise Laplante introduces new collages made with antique paper from found books. Each work contains a story often about women, botany, or animals that is inspired by the pages they're built upon. In the tradition of scrapbooks or memory boxes, the work is also riddled with personal references which are blurred with whitewash “the way memories are blurred by distance” and finally encased by a surface of encaustic. Laplante’s career as a head university librarian further explains her love of books and ephemera. She exhibits across the Northeast and has shown with Carrie Haddad for more than ten years. Matthew Hopkins is a contemporary painter that finds significance in the familiar. In the His & Hers series, Hopkins provides an intimate portrayal of individual undergarments and cravats with vivid hues of watercolor on solid white paper. Hopkins skillfully plays with light and transparency to give dimension to his richly detailed still lifes. Hopkins studied at the Pratt Institute in Brooklyn and the College of Saint Rose in Albany. His paintings both in watercolor and oil have been exhibited and honored in numerous regional and national exhibitions and are featured in many private collections. Watercolors by abstract painter, Edward Avedisian will also be on view. Deemed the Wunderkind of the New York School in the early 60s and 70s, Avedisian was propelled into the art scene and quickly rose to fame with his color field paintings and bold, lyrical abstractions. Avedisian’s watercolor paintings on paper, small yet commanding, are beautiful representations of color's ability to entice a visual game, defining spatial fluctuations as stripes of deep blues and greens resonate into bright pinks and yellows. Avedisian’s work is in the permanent collections of the Museum of Modern Art, the Whitney, Guggenheim, and the Metropolitan Museum of Art. Fellow artist, William Bond Walker, began painting when Abstract Expressionism reached its peak in America. Subtle hints of the movement’s influence can be found in Bond Walker’s work made with boldly colorful palettes of acrylic. Similar to the way art of that period evolved during the process, Walker allows his paintings to develop intuitively rather than constricting his subject to a preconceived plan. With a background in ceramics, Anne Francey turns to paper to expand on the Seismography’s series. Black and white abstractions take on forms that could only be found in nature; seed pods, bramble, and flowering buds evolve from thin strokes of white on black, opaque backgrounds. Organic shapes strive to find a semblance of order, yet still inevitably incorporate the unpredictable nature of the artist’s hand. Born in Switzerland, the artist travels frequently to Tunisia and incorporates the Middle Eastern aesthetic with the nature that currently surrounds her where she lives in Saratoga, NY. Mark Beard has charmed audiences for more than 2 decades as Bruce Sargeant with portraits and murals painted in the style of John Singer Sargeant of strapping, young athletic figures in various landscapes and locker rooms. As Mark Beard, he continues to hone his skills and dutifully sketches from live models once a week in his Manhattan studio. The result of this dedicated practice is a dynamic selection of works on paper sketched with graphite pencil and conte crayon on 30 x 22 inch Arches paper. Gabriel de la Portilla debuts a selections of abstract acrylic paintings that speak to the artist’s interest in myths and myth-making. The three drawings in this exhibit titled Caliban, Exile, and That Bides its Time and Bites were strongly influenced by Robert Browning’s poem, “Caliban Upon Setebos” which questions man’s place in nature’s order and the struggle with religion. The title character’s soliloquy is riddled with concrete examples from the natural world, appealing to the artist’s desire to explore hidden meanings behind what is readily visible or accepted.